With their sights set on the highest summit in the world, the Berg Adventures’ Everest Expedition 2006 team will be breaking new ground and setting new standards in mountain climbing this fall. Lead by four-time Everest summitter Wally Berg, and seven-time summiter Dave Hahn, this is an exceptionally strong team that is garnering much attention. The team will have the opportunity to approach climbing Everest is a simple, unfettered style, one team with all the equipment and support they need. Leadership, respect for one another, respect for the mountain and love for the Sherpa people and their traditions and culture living at the base of the Mother Goddess Chomolonga, or Mt. Everest ,will define our efforts this fall. Watch here for regular reports form this exceptional team of adventurers. 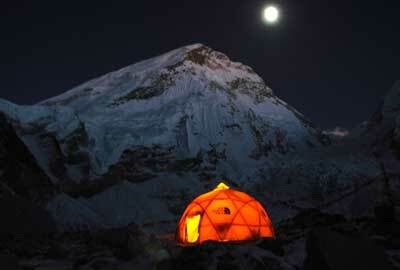 October 17, 2006 (Oct. 18 Nepal Time) SUMMIT!!! October 12, 3006  Happy Birthday Jimmy! October 8, 2006  New Permit for Everest Issued on October 8th??!! September 25, 2006  Happy 51st Birthday, Michael! September 11, 2006  Pooja Day! August 30, 2006  Berg Adventures 2006 Everest Expedition is Underway!